ARE YOU ready to get together with 'Everyday People', 'Dance To The Music', and have some 'Hot Fun' at the end of the summertime, and say at the end of it all, 'Thank You (Falettinme Be Mice Elf Agin )'? The Family Stone are coming to the Róisín Dubh this Saturday at 8pm playing the classic hits of Sly and The Family Stone, the ground breaking funk, soul, R&B, and psychedelic rock band, who also featured a membership of black and white, male and female, musicians, when such things were still extremely rare. The band features saxophonist Jerry Martini and drummer Greg Errico. Both have been inducted into the Rock & Roll Hall of Fame, and both are original members of Sly and The Family Stone, playing on such classic soul-funk albums as Stand! (1969 ) and There's A Riot Goin' On (1971 ), and on all the band's best known songs. Martini has since worked with Prince, Carlos Santana, Bill Wyman, Robert Cray, and Van Morrison. Errico work as a songwriter brought him No1 position on the world pop charts in 2014 for 'Timber', which also won an ASCAP Pop Music Award for being among the most performed ASCAP pop songs of 2014. He is a managing director of Unity Music Foundation, for which he has produced several albums for jazz musicians. 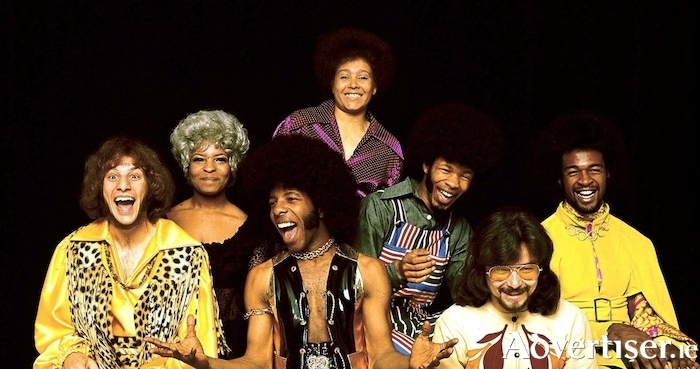 Also in the band is singer and multi-instrumentalist Raw Syl, the daughter of Sly Stone and original Family Stone trumpeter Cynthia Robinson. Their live performances have enjoyed critical acclaim, with The Irish Times praising their "infectious brand of high energy funk...played by genuine legends".